These three panels may have been the top of a polyptych similar to the one by Mariotto di Nardo in the Galleria dell’Accademia in Florence, whose central panel depicts a Virgin and Child. 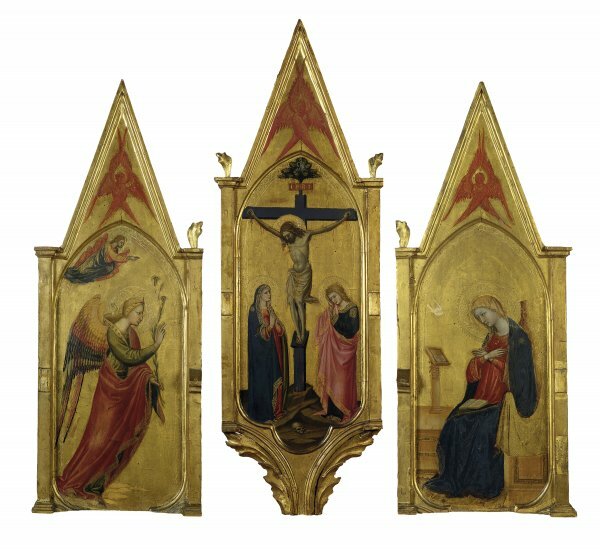 These panels, which were formerly in the Somerwell collection in Scotland, were auctioned at Sotheby’s in 1970 and were acquired for the Thyssen-Bornemisza collection in 1976. On the reverse of the Annunciate Angelis an old label that attributes the paintings to Giottino and states that they were in one of the storerooms in Santa Maria del Fiore in Florence when these buildings were demolished in 1826 to enlarge the square on which they were located. The panels, which were unpublished prior to the auction of 1970, were catalogued as by Bicci di Lorenzo, an attribution that continues to be accepted today. For the two Annunciation panels the artist followed the traditional iconographic model used in Tuscan art in the 14th and 15th centuries: the Virgin is depicted seated with a book on her knees. She receives the message from the Angel Gabriel who approaches her on clouds, a detail that indicates that the angel arrives from Heaven. The Holy Spirit, sent by God the Father, is located above the Archangel and represented as Christ, who descends on the other panel towards Mary in the form of a dove. The Crucifixion panel, with Christ still bleeding from his wounds, only includes the essential figures of the Virgin and Saint John. At the foot of the cross and near a pool of blood dripping from the plinth of the cross is Adam’s skull, whose presence, like the blood around it, symbolises the purification of Original Sin. At the top of the cross, from which a bright green branch is sprouting, is a pelican with its four young. According to legend, the pelican feeds its young on the blood that spouts from a wound that the bird makes in its own breast. The bird, combined with the crucifixion, emphasises Christ’s nature as Redeemer. It has been tentatively suggested that the other elements in this polyptych were two panels with pairs of saints: Thaddeus and John the Baptist, and James the Less and Nicholas of Bari, both in the Pinacoteca Stuard in Parma. According to Boskovits these panels would have flanked a Virgin and Child, in an arrangement similar to the above-mentioned polyptych by Mariotto di Nardo. Bicci di Lorenzo, who inherited a large workshop from his father, continued to use Gothic formulas well into the 15thcentury, introducing small changes in an effort to modernise his style. This group has been dated around 1430.